Continuing its thirty year old tradition CW club U-QRQ-C has the honor to invite all CW and Shortwave fans to the International CW Operators HAMfest. The HAMfest’s Lucky Charm is still a high speed QRQ HAMster, who had been running for dear life and reached his running destination. And other organizations whose names will be published later. There is no requirement to operate CW (Morse Code) at QRQ speeds in order to participation in the HAMfest (it is not HST World Championship with participants selection), nor to operate CW at all, though it is highly desirable. It’s enough if you are fascinated with short waves as a whole. And then – who knows – maybe coming to the HAMfest will push you to study http://www.3w3rr.ru/2014/05/dikson-ua0bad-cw.html> Morse Code in the future. But do watch how QRQ masters do it. – The shower is already working. – Negotiations with goldfishes were also conducted – they agreed to be caught with spinning rods. – Mushrooms question is under study. Anyway, you may bring your owns and plant them under the pines. * Yuri 3W8AA: telephone in Russia +7-903-795-98-91. Participation in the HAMfest is free (no fee). Moreover, your money is no good in Radiograd: HAMfest area is free of commerce of any kind. So bring anything you might need, and if you will forget anything – your new friends will help you. Bring extras and spares to share with others and it will be enough for everyone around. See the details below. How to get to http://www.uqrqc.com/p/kak-doehat.html>> Radiograd. As it is unlikely that anyone will decide to arrive to the HAMfest by military tank, submarine, helicopter or to parachute out from the airplane (though the idea sounds interesting, and in the future we could organize mass parachute jumps), the story will be about how to reach Radiograd from Moscow by car or by fixed-route taxi-van. Or for that it worth, by feet or by bicycle, but then you have to leave your home way in advance. 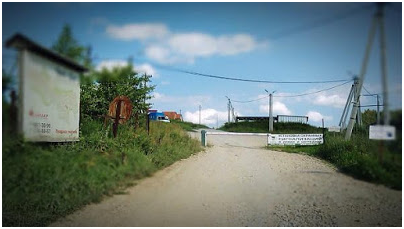 HAMfest will take place in Radiograd, on the territory of “Live Villages” complex, which is under construction yet, and which has the area of 78 hectares (garden plots “Miracle tree”). At once we warn you: don’t go by train/suburban train – nearest railroad station is located too far from Radiograd. 2) From the route to Radiograd. 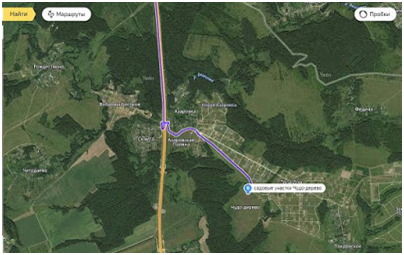 To ride along Simferopol highway (route M2 Moscow – Tula) up to kilometer mark “112 km” (it is 92 km from Moscow Ring Road) (Fig.1). Waymark on the navigator – Azarovka village, Zaoksky district, Tula region, Russia. Those, who have no personal car can use fixed-route taxi van. 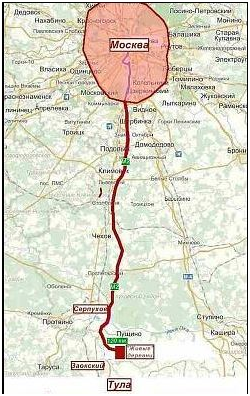 Take any of them traveling towards Tula, it will be OK.
We recommend fixed-route taxis from “Novoyasenevskaya” bus station located near metro (underground, subway) station of the same name. They leave for Tula every 40 minutes. Time of travel to the “drop point” point” is 1 hour 10 minutes. You should go as far as the turn to “Bobrovy island” by fixed-route taxi. It is same 92nd km from Moscow Ring Road, and drivers know the place. Between the road posts “112” and “113” km you have to leave the road to the right and pass under the bridge to the opposite side of the road and exit to the left. Then you have immediately turn into unpaved road in upper right direction and move along it up to the gate barrier (Fig. 4). It is port of entry to “Your home” settlement. 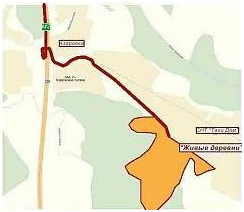 Coordinates of gate barrier: Azarovka, Tula region, 54.773460, 37.495655. If the gate barrier is closed, contact Headquarters log hut on frequency 145,500 or call +7-906-646-47-14, +7-903-795-98-91. You will then see four roads – to the left, straight, one bending slightly to the right and another one with a bigger bend to the right. The latter ends against the fence with the gates. Take the one with the slight bend to the right and it goes up. You will pass metal box van to your right side. Fig. 4 Gate near entry. Ride along for about 700 meters (the road quality there is a poor one). Before turning to the right, notice a very beautiful lonely pine tree to your right – you just can’t miss it. The right turn is paved with fresh gravel, the pine stays to your left side, go down another hundred meters and arrive at the entrance to Radiograd territory. Coordinates of the destination point: 54.765057, 37.507984. 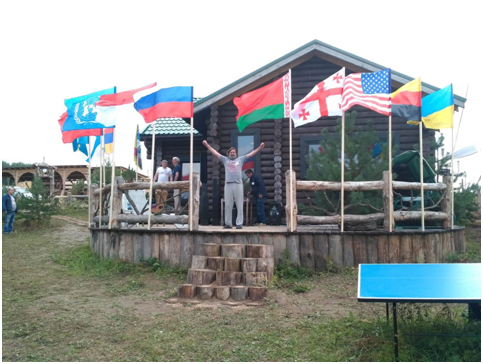 Base VHF station under control of Aleksey RA3AKF, will be on standby at 145.500 МГц and 145.580 MHz. If your car is equipped with VHF radio and you need directions to Radiograd – he will lead you in. Anyway, contact the HAMfest station as any other DX station – QSL cards will be sent out also for VHF QSOs, see the details below. 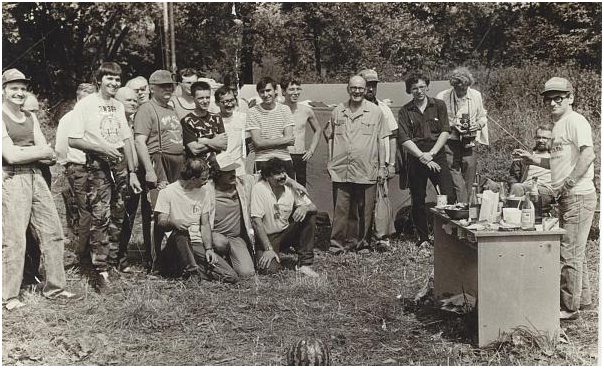 Hamfest 1991. From archive of Vladimir, UA9BA. Let us get together, fellows. In spite of troubles, years and borders. Those who come just for a day, without overnight stay – plan to spend Saturday with us, where main events will take place, though enough action will take place throughout the entire festival duration. Those who come for one day only have no reasons for staying overnight, but be prepared in case you change your mind. Those who will surely stay overnight must bring sleeping bags or warm blankets. Bring tents too, it is highly desirable. 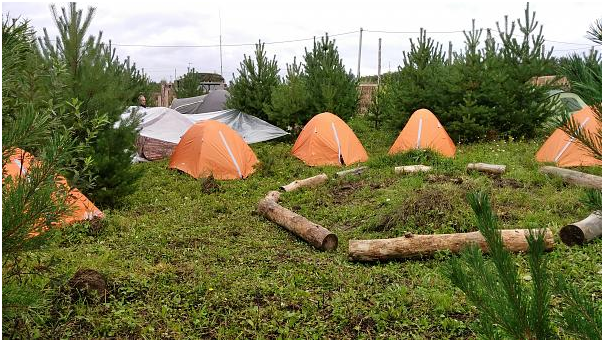 Few tents will be at the site, but it may not be enough to accommodate everyone, so your own tent can save the day. There are two log huts on Radiograd territory. By this winter they will add dozen of cottages, but they are not built yet. River, lake, pine forest and meadows with cornflowers and dragonflies are also very much in place. One log hut is slanted for headquarters. Radio station, HAMfest headquarters containing all that office appliances and refrigerator for Perm vodka supplies will be stored there. Not much will be left to sleepovers. Another log hut, located near the lake will be converted into the hayloft or better to say, into “branchloft”: sleeping bags may be laid onto pine boughs. If you happen to be a mermaid, they you have the opportunity settle down in the lake, with the goldfishes. Those who attended last year – please spread the information on how things were organized and offer your advice to new attendees. There is a hotel few kilometers away from Radiograd. So if you must stay in a more civilized environment, then can walk to the HAMfest. Or travel in a palanquin. * those desiring prolonged R+R – you may arrive a week earlier, in the middle of August – to help Yuri 3W8AA, Vladimir UA9FAR and Aleksey RA3AKF with preparatory work at Radiograd. Remember to bring the extras and the spares to share with others (especially if you are bringing friends), like meals, alcohols, soldering flux, tools and other stuff, that might be very desirable and useful at the HAMfest site. Though the HAMfest is also somewhat a kind of mini-championship, our environment is less formal, dress code is free. Suits, ties and stiletto pumps are not necessary, but the breeches are obligatory. Swim briefs/swimsuits can also be of use – to sunbathe. Skniga River and goldfish lake can be very seductive for swimming (especially to those who have not read “HAMfest goldfishing championship” article). 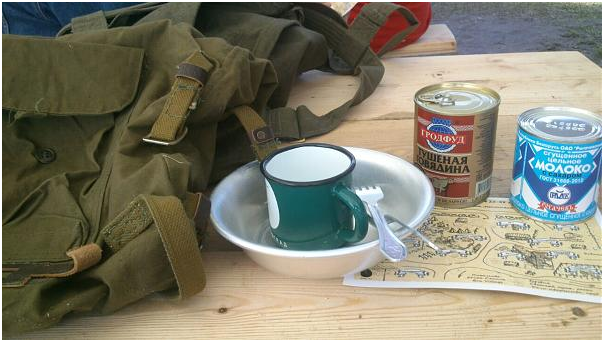 * A mug and a bowl (better metal than plastic or glass), spoon, knife. If you are better with pliers than with silverware at the dinner table, then bring the pliers. Guitar if you know how to play it. Are there any sax players in the audience? Those who arrive by cars – everything in sight what could appear useful - throw it into the trunks for the HAMfest – who knows what might come useful – soldering iron with rosin, piece of wire, angle grinder, box of vodka or gravitsappa. If anyone will need anything – here it is – magically you have it in your trunk, everyone will be awed! Especially it relates to items in perennially short supply. This year in Phnom Penh fried spiders were sold at approximately for $0.08 (USD) (in conversion to the official exchanging rate) per good size portion. This means that they have no problems with spider shortage there. So, perhaps you are thinking: where is that Phnom Penh with its spiders, and where is Radiograd? One should have no reasons to be afraid of such menu items. And maybe you shrug your shoulders – how can they bring those spiders here – and most important – can you eat them? This is how Vladimir Malygin RL2D (then – 4K2BDU) had initially sneered when he was in Moscow, while en route from from Franz Josef Land to Dikson island in beginning of 1990. He went to “Kyylong” restaurant in Yasenevo and they served him a snake for the snack with explanation that he had no alternative but to eat it. In conclusion: whether there will there be a field kitchen or not – is not clear yet, so make arrangements to bring with you not only bush pot but also an assortment foods in assortment and lots of them. The more of the unexpected assortment, more picturesque and colorful the nearby meadow will be. 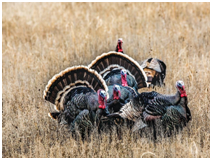 So anyway - with turkeys or without them we shall manage everything.